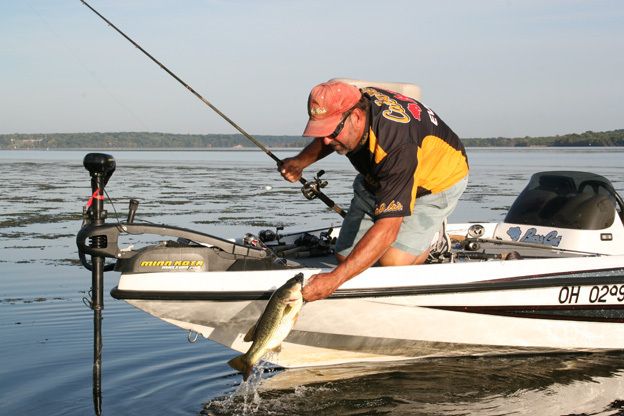 For Tidal Potomac bass fishing, find grass, find bass. Subaquatic vegetation comes in many species, taking root in shallow flats, bays and creeks. This changes every season, but one thing is sure, milfoil is the preferred grass for bass and bass anglers. Native grass like water celery would be preferred, but fish have adapted to non-natives like, milfoil that used to dominate the SAV landscape. Architecturally unique, milfoil grows vertically and creates top to bottom cover and allows access for anglers. More importantly, it emerges pre-spawn and allows early cover for bass nests and fry and supports microhabitats. Dr. Joe Love, MD DNR Tidal Fisheries Manager says highly dense SAV, like Hydrilla, may be more prone to low oxygen events and perhaps limit aquatic organisms that use that habitat. Shortly after 2001, grasses disappeared from the immense flats above and below the Woodrow Wilson Bridge north into DC and south below Dogue Creek. A few theories include the simultaneous Wilson Bridge and National Harbor projects, and storms. In its place came the early summer emergence of hydrilla, choking out fishing locations, which made fishing very difficult. Virginia Institute of Marine Science data indicated a major decline in tidal Potomac and upper Chesapeake Bay SAVs after 2011. Since, there’s been increase in SAV cover. 2016 was a great year of SAV growth. Specifically, DC reports their low point was 24 acres in 2003 but expanded to nearly 1200 acres in 2016. The big mat above and below the Wilson Bridge has revegetated, albeit not with milfoil. Additionally, only about 3% of the SAV in DC is milfoil, a far cry from its dominance in the 1990s. In 2012, DC began SAV restoration efforts of native wild celery near the mouth of the Anacostia River. Enclosures allowed the grass to take root. Since, it has expanded onto former grass flats. In addition, Star Grass has taken root. While it can provide benefits, it is not apparent fish utilize it as they would milfoil. Daniel Ryan, Fisheries Research Branch Chief, says SAV coverage is highly variable and driven by turbidity and spring flow rates more than anything else. VA and MD agree SAV coverage was much better this year however many historically covered areas were still vacant. While DC planted grasses, for three years Virginia Department of Game and Inland Fisheries has harvested tons of highly invasive Water Chestnuts out of Pohick Bay. Last year their hand pulling efforts were aided by a lot of spring storms. It will be monitored this year as this plant can spread rapidly and has a Potomac track record of blocking navigation and costing millions to remove. This plant is not very good fish cover and crowds out beneficial grasses. In areas where grass cover has been slow to return, Maryland DNR has spearheaded an effort to plant cover for bait and bass in National Harbor. Reef balls were constructed and later placed on a former grass flat. A follow up wood cover placement is planned for spring. Regional biologists agree there will continue to be assaults on Potomac grasses. Nature, development and invasive plants are factors. But it’s when water is too cloudy, often caused by pollution from excess nutrients and sediment, for sunlight to reach them, that grasses die. Pollution from many sources, including farms, sewage, fertilizer and development influence the dynamics of SAV. Dr. Love says SAVs require the same elements needed by a garden, light penetration, soil and seeding, and nutrients. Storms or dredging can negatively affect water clarity, affecting SAV growth. Dredging also affects the seed bank and water clarity and causes long-term negative impacts to SAV. But there are other issues more difficult to contend with. The commercial fishing practice of haul seining has a direct impact on grass and fish. This fish harvesting process not only destroys grass beds, but also disturbs fish during the spawn, making it an obvious target to improved habitat and the fishery. Restrictions on commercial fishing are difficult, but are on the table for MD’s Black Bass Advisory Subcommittee and Virginia guide Capt. George Martin, who continues to appeal to the Virginia Marine Resources Commission. Rather than singling out angler behavior, it’s time to get serious about pursuing actions to allow Mother Nature to do her job with undisturbed grass beds for more effective spawns. Water temperature dropped into the mid 30s in January. Tie on Silver Buddy lures, ½ ounce silver in clearer water on sunny days, gold when clouds are present or water is slightly stained. Use 10-pound test GAMMA Edge on 15-pound GAMMA Torque braid main line. Gently burp down drops. Fish are in areas with steep drops, close to flats and out of the current. After that it’s slow presentations with Mann’s Stingray Grubs on ¼ ounce ball head jigs, Mizmo tubes with insert heads, Punisher Hair jigs and Mizmo Barbwire shaky heads with Doodle worms. Soak baits in Jack’s Juice Bait Spray. Use 6-pound test GAMMA Edge fluorocarbon line on Quantum Smoke spinning gear. Spraying Real Magic makes line easier to cast in cold weather. In warmer discharge areas like Quantico Creek, Blue Plains and Four Mile Run, use Lucky Craft Pointer 78 suspending jerkbaits and Lucky Craft Bevy Shad crankbaits in deeper spots. Vary length of pauses. Use 6-pound test line and make long casts. Dropshot with 1/0 Mustad Mega bite hooks with 5 inch Mizmo Doodle worms on Edge 6 pound test. A 3/16 or ¼ ounce Water Gremlin BullShot weight will keep this presentation in the same spot a while. Leaders about 6 inches or a bit shorter. Slowly dragging split shot rigs with either a 1/8 or 3/16 ounce BullShot bullet-shaped split shot. Small creature baits like the Mizmo Swamp Monster can be paused and then moved. Mizmo Doodle worms work too. « Exercise with your Sweetheart!